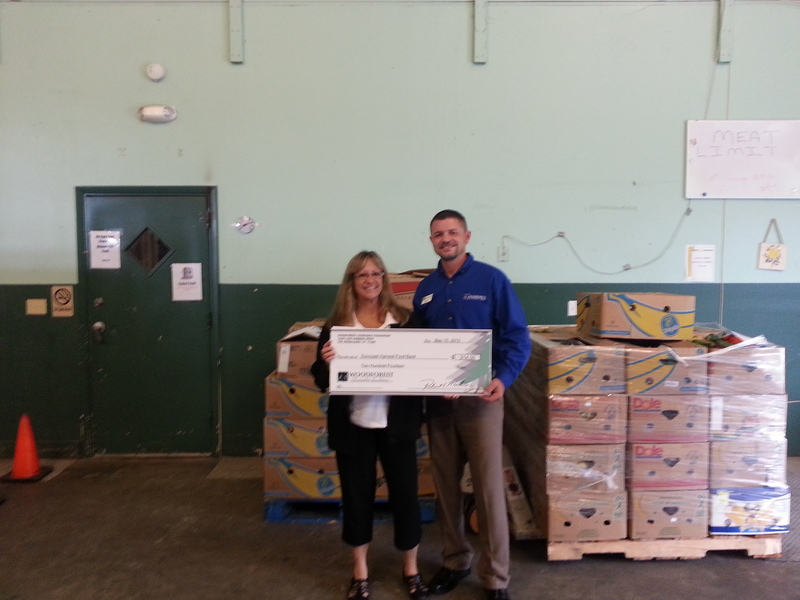 Suncoast Harvest Food Bank receives $214 donation from Woodforest Charitable Foundation. Photo Caption:Presenting the check to Kathy Mullen, Branch Coordinator, Suncoast Harvest Food Bank is Brian Collins, WNB Branch Manager, Brooksville, Florida. Land O’Lakes, FL – On a continual basis Woodforest National Bank employees perform a multitude of fundraising events benefitting the Woodforest Charitable Foundation. Both Woodforest National Bank and Woodforest Charitable Foundation are committed to making a positive impact in the communities in which Woodforest serves. This partnership benefits the community and organizations such as Suncoast Harvest Food Bank which recently received a $214 donation from the Woodforest Charitable Foundation. Established in 1991, Suncoast Harvest Food Bank supplies nutritious food, household, personal care items and paper products to over 160 charitable feeding programs serving low-income and poverty stricken people in their multi-county service area. The food bank serves as a central warehouse distribution center to local food pantries. More than 100 agencies pick up from the food bank to distribute to their service areas. Partner agencies include faith and community based food pantries, health clinics, senior service centers, domestic violence and homeless shelters, and homes for the mentally ill, the disabled and troubled youth. Suncoast Harvest Food Bank is affiliated with Feeding America, the nation’s largest leading domestic hunger-relief charity, serving more than 37 million Americans each year. The Food Bank’s objective is to alleviate hunger, which in turn fortifies the will of individuals and families to succeed and improves their health. For more than 20 years Clara Lawhead, founder of Suncoast Harvest Food Bank, and her dedicated team have provided nutritious meals to thousands of needy citizens in their four county region. Today, the food bank sits on a 5-acre tract of land with a double warehouse facility that houses more than 300,000 pounds of food. A well-balanced, nutritional diet is the foundation upon which individuals build a better life. Today almost 100,000 residents of Pasco, Hernando, Citrus, and Sumter Counties live in poverty and over 15,000 adults are unemployed. For more information about Suncoast Harvest Food Bank, please call (813)929-0200. The Woodforest Charitable Foundation was created by Woodforest National Bank in 2005 as a direct result of its desire to support and invest in the communities in which it serves. The Foundation is committed to assisting those in need, enriching lives and communities through dedicated leadership and faithful administration by providing funding to qualifying 501(c)(3) charities. For additional information regarding the Woodforest Charitable Foundation, call (832) 375-CARE (2273) or visit the foundation’s website at www.woodforestcharitablefoundation.org. Celebrating 32 years of service and ranked among the top earning banks in the United States, the Woodforest family of banks currently has assets of approximately $3.7 billion and services more than 837,000 customers with branches in excess of 760 throughout seventeen states: Texas, Alabama, Florida, Georgia, Illinois, Indiana, Kentucky, Louisiana, Maryland, Mississippi, New York, North Carolina, Ohio, Pennsylvania, South Carolina, Virginia and West Virginia. For information about Woodforest National Bank, please call 832-375-2000 or visit the bank’s website at www.woodforest.com.